Were the ancient Egyptians VEGETARIAN? From the building of vast pyramids to religious life and burial practices, life in ancient Egypt was very different to our own. But modern vegetarians may have more in common than they thought with the ancient Egyptians, because it is thought that they also ate a diet composed largely of vegetables, fruit, wheat and barley. Archaeologists have thought for a while that most settled ancient populations survived on a vegetarian diet and now carbon isotope analysis has given experts a better idea than ever before of what the ancient Egyptians ate. A team of researchers from the University of Lyon studied carbon atoms in 45 mummies that lived in Egypt between 3,500BC and 600AD. 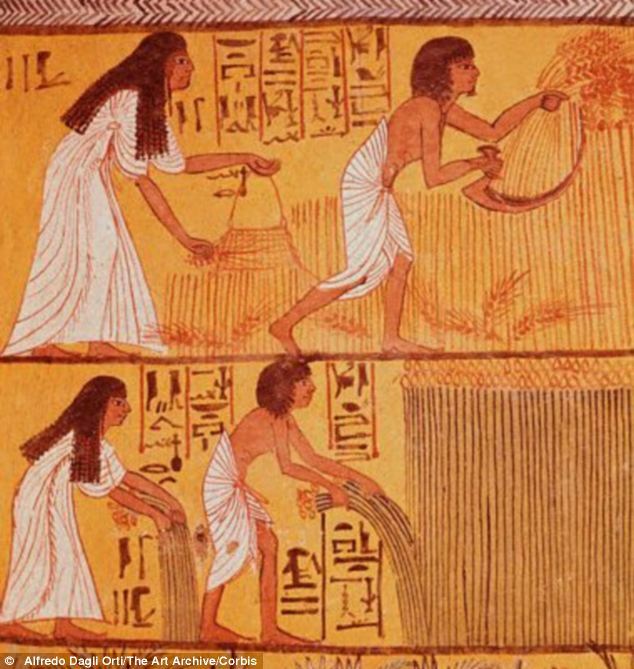 They found that all the mummies ate a lot of barley and wheat, indicating that the Egyptians were skilled farmers. The ancient people ate mostly ‘C3’ plants such as garlic, aubergines, pears, lentils and wheat, but less than 10 per cent of their diet was made up of C4 seeds such as millet and sorghum. They ate remarkably little fish, according to the study. 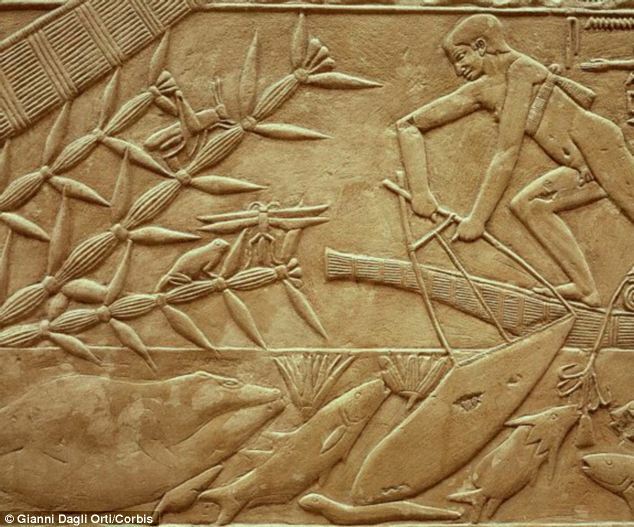 This has surprised some experts because archaeological evidence has proved otherwise and there are a lot of paintings in tombs showing people fishing with nets and poles. A team of researchers from the University of Lyon studied carbon atoms in 45 mummies of people that lived in Egypt between 3,500BC and 600AD. They found that they ate a lot of barley and wheat over the long period, suggesting that they adapted to the region incredibly well. 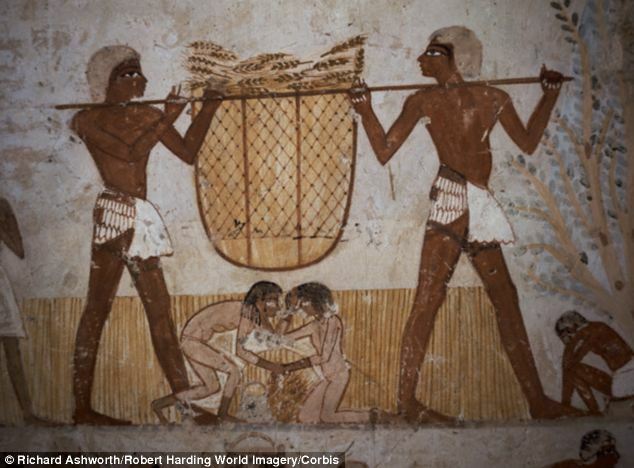 The finding also echoes many paintings in Egyptian tombs that show people working the land and harvesting wheat to make loaves of bread, which are often offered to god of the afterlife, Osiris. Carbon atoms are taken in by plants from carbon dioxide in the process of photosynthesis and carbon ends up in human bodies by eating the plants or by eating animals that eat the plants, Live Science reported. Scientists can investigate a person’s diet by studying the isotopes carbon-12 and carbon-13, which have slightly different masses. Plants are divided into two groups: C3, which includes garlic, aubergines, pears, lentils and wheat and C4, which comprises millet and sorghum, which are seedy grasses. C3 plants take in less carbon-13 than the C4 group so researchers can work out what people ate by measuring the ratio of the two isotopes. If a person ate a lot of C3 plants, the concentration of carbon-13 isotopes in their body will be lower than if they mainly ate foods from the C4 group. Research leader Alexandra Touzeau, of the University of Lyon, explained that they took samples from bones and teeth instead of hair, collagen and proteins like in other studies. ‘We also worked on many different periods, with not many individuals for each period, so we could cover a very long time span,’ she said. The scientists compared the carbon isotope ratios with those measured in pigs, which had been fed on a strict diet of different proportions of C3 and C4 food. The animals have a similar metabolism to humans so the carbon ratios could be compared to the mummies’. When the results were also compared to isotope ratios in the hair of modern European vegetarians, the experts could confirm that the ancient Egyptians were mostly vegetarians, eating a diet based around wheat and barley. They found that C4 seeds made up less than 10 per cent of their diet, but surprisingly that the mummies had not eaten much fish in their lifetime. It has previously been assumed that the ancient Egyptians ate fish which they caught in the Nile, as seen in paintings in tombs.